I might be losing my taste for cake. Just a little. After baking so many cakes this fall since starting my business, they just seem to have lost some of their appeal. I still taste a bite or two – I have to make sure they’re good, of course, so I can tweak my recipes if needed – but haven’t eaten a whole piece of one in a while. It’s actually been a conscious effort, too, not to sample too much of my baking but just to let others enjoy it. And last week I managed to not eat anything sweet all week – no candy, no cupcakes, no ice cream… On Sunday, though, I made a few individual desserts for Jamie and me. It’s the perfect way to get a little something sweet without having a whole enormous cake sitting temptingly on the kitchen counter, beckoning you to have a piece at 11pm, when you’re already full from dinner and don’t need something sweet. It’s just a want moment. And while I haven’t made caramel apples since high school, I wanted a dessert that was somewhat reminiscent of a caramel apple. 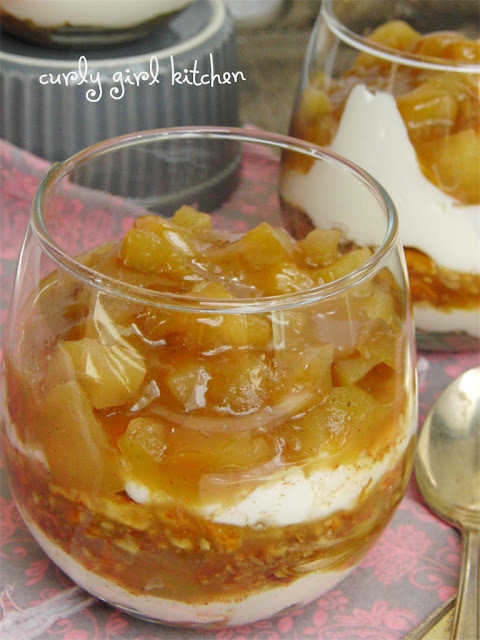 Caramel Apple Cheesecake Trifle. 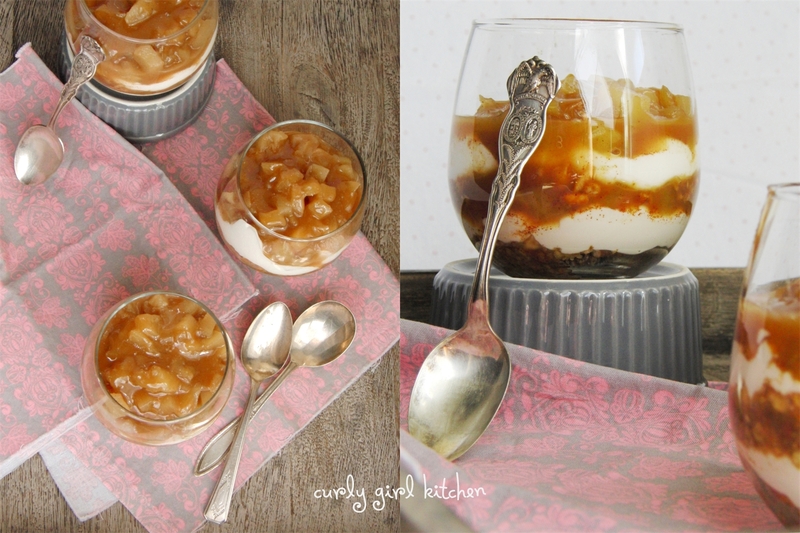 Trifles are a great way to make individual desserts in small jars, glasses or whatever you have, and all the layers let you incorporate so many different flavors and textures. This one had everything I could want in a trifle – creamy, crunchy, salty and sweet. Trifles are also very adaptable – the recipe isn’t an exact science (like baking a cake would be) so the proportions of each layer can be changed to suit anyone’s taste. 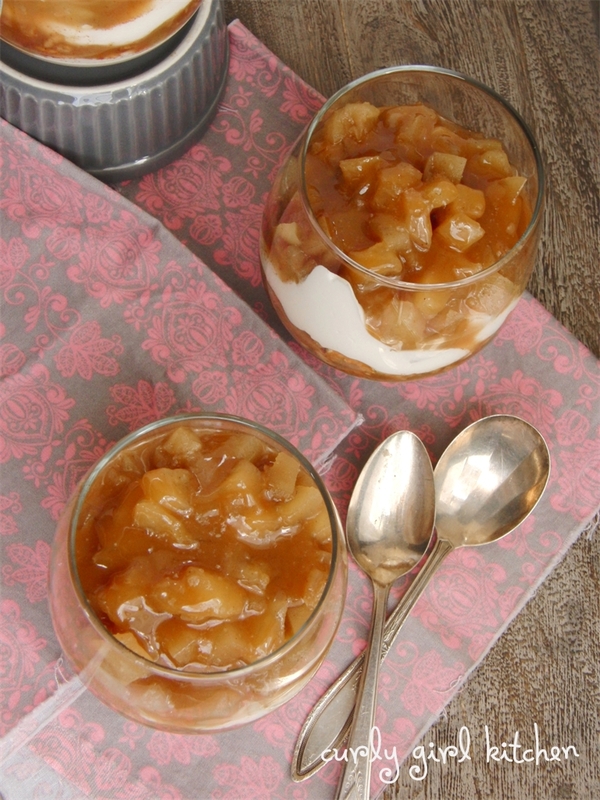 I started by simmering apples with brown sugar and cinnamon, until they were soft and beautifully golden, then cooled the apple compote completely. Be sure you do cool it completely – otherwise the hot apple mixture can “break” the dairy layer, causing it to crack or curdle. 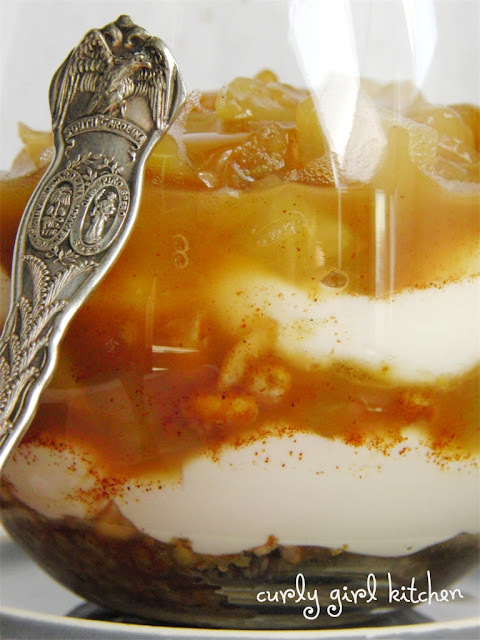 For the no-bake “cheesecake” layer, I whipped light cream cheese with light sour cream and non-fat Greek yogurt (the sour cream and yogurt could certainly be substituted with whipping cream, for a richer result). A combination of salted crushed pecans and pretzels for the “crust”. And of course, generous drizzles of caramel. A pinch of coarse sea salt on top looked pretty, and brought out the flavor of the caramel even more. In a medium saucepan, combine the apples, brown sugar, 1 tablespoons butter, cinnamon and water. Cook over medium low heat, stirring occasionally, until the apples are soft and caramelized and most of the water has evaporated but it’s still syrupy. Pour into a bowl, cover and refrigerate until completely cooled. In a bowl, whip the cream cheese, sour cream, yogurt, vanilla and powdered sugar until smooth. Set aside. In a separate bowl, toss the crushed pretzels and pecans with the salt and the remaining 1 tablespoon butter (melted). Set out 6 glasses. Spoon half of the pretzel crumbs into the bottom of each glass and press down gently. Top the crumbs with half of the cream cheese/whipped cream mixture (I used a piping bag to get a clean, even layer). Top the cream with half the caramelized apples. Top the apples with half the salted caramel. Repeat all the layers, using up the rest of the ingredients. Refrigerate until ready to serve, but set out at room temperature for 1 hour before hand, so the caramel is not too firm. Cook's Note: All the separate elements can be made up to two days in advance, but the trifles shouldn't be assembled until the day you plan to eat them, since the pretzel layer will get soggy after a day after soaking up the moisture from the other layers.